Chris Crooks’ fierce velociraptor sculptures add a touch of Cretaceous creativity to your lawn or garden. Velociraptor means "swift thief." Fitting, since these handmade dinosaur sculptures will steal the show in your lawn or garden. Cut from cold rolled steel by metal master Chris Crooks, each delightful dino features details—like fierce claws and silhouetted feathers—that make them stand out, whether you're staking them among bushes or displaying them in a wide-open space. 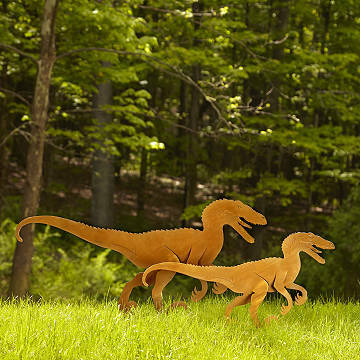 Each set of two raptors includes one small and one large, making them a fun gift for a dino-loving dad, or anyone who wants to add a little Cretaceous creativity to their outdoor decor. Handmade in Arizona. Includes four 6" stakes, two for each dinosaur. Wash with hose. Patina will darken over time. We have these velociraptors in our front yard and the kids (and adults) who walk by on their way to the park love them! It is fun to watch passers-by enjoy them just as much as we do. Absolutely love these guys. It will be fun to watch how my mate moves them and the shark around the backyard when he mows!! I purchased because I couldn't believe the price for these two handmade critters and wasn't expecting a lot. I was surprised and very pleased with the quality, detail and the 3D aspect of both. Tickled pink. Love how unique they are and that it's fun while still being a classy ornament for the yard. My husband loves them! This was a great gift. The pair of them go perfectly together and they are tactful and fun at the same time. Something that is hard to find in lawn decor/art!